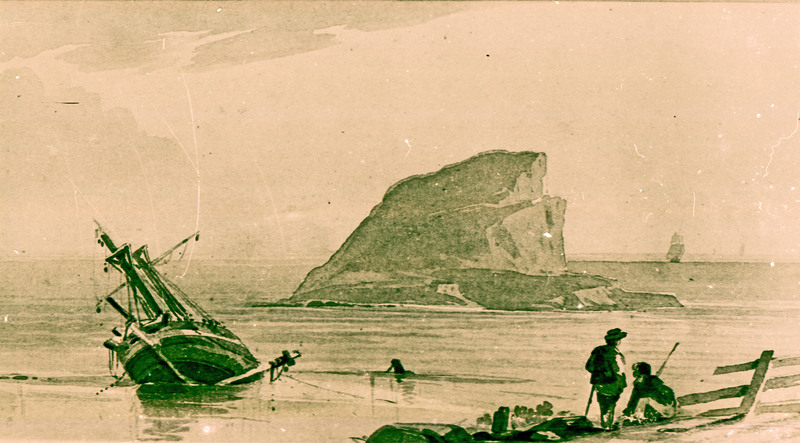 Sketch of Nobbys, Newcastle, NSW, Early 1820s. UoN Bert Lovett Collection. In 1801, the first ship to moor in the Hunter River was the “Anna Josepha” a brig owned privately by Simon Lord. The ship was originally anchored near Pirate Point. They then moved to the southern shore, where the crew camped and gathered coal from the beach and cliff faces which they carried in bags and baskets to the ship. They also cut timber and rafted it down the river. After about two months they left the river, sailing with their cargo for Sydney. Soon after, in June 1801, the ‘Lady Nelson’ was commissioned by the government to survey the Hunter River. The navigating vessel ‘Lady Nelson’ was built specifically for exploring the coastal areas of Australia. Under the command Lieutenant-Colonel Paterson, it determined the accessibility of the river and the quality of coal in the region. The aboriginal leader Bungaree sailed on the Lady Nelson for this survey to act as interpreter and intermediary. The schooner ‘Francis’ sailed alongside the ‘Lady Nelson’ for this trip with the purpose of carrying a cargo of coal. The illustration above depicts the a view the crew of the ships might have seen while surveying. During this visit the rock at the opening of the river (present-day Nobby’s, known by the Aboriginal people as Whibayganda) was named ‘Coal Island’. Sailors Paterson, Grant, Barrallier and Harris took smaller boats to explore the Hunter River as it wound inland, making it all the way to present day Singleton. Abbott, J.H.M. The Newcastle Packets and the Hunter Valley. Sydney: Currawong Publishing Co., 1943. Print. Marsden, S. Coals to Newcastle. Wagga Wagga, NSW: Bobby Graham Publishers, 2002. Print.